I have noticed that my account at We7 is showing that I have 1 ad free day available and that this is 100% of what is possible. Previously they allowed you to earn up to five advert free days by listening with ads for a certain period of time. I had noticed it being reduced to three and now its down to one, so it looks like they are moving to removing ads only if you pay the subscription. I did try the free trial subscription for my android phone, but found that the player crashed fairly regularly. It was quite nice on other ways as it stored tracks on the SD card so that if they were requested, but had previously been listened to they ran from the card rather than using bandwidth. In the end, though, it was just too annoying so I did not continue it with a subscription. Wordpress has had built in mobile functionality for some time, but now Blogger has caught up. The feature can be found by logging into Blogger, switching to "Blogger in Draft" and going to "Settings" then "Email & Mobile". There you can switch on the mobile version. In the next month or so this will be moved out of "draft" and put into the main Blogger so if you are reading this in the future then it will be easier to find. I backed up my template before switching it on, but it did not affect my modified template or overwrite it with the standard one. This means it should be safe to turn on, but backing up is always a good idea. 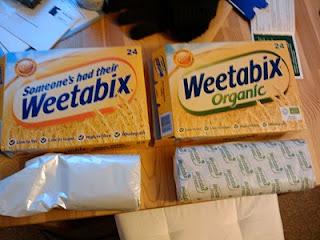 Having just bought a box of Organic Weetabix I have found that the internal wrappers are made of paper (and therefore recyclable) where the standard Weetabix has plastic and is marked "not currently recyclable ". Weetabix used to have paper wrappers, but went plastic at some point in the 1990's. Why is the organic version now paper? There can't be a different packaging requirement so my guess is that in order to sell to the sort of person who buys organic products the packaging has to be 100% recyclable. I could be wrong though. Does anyone from the manufacturer want to comment? Many thanks for your comments about the paper packaging. We conducted a short-term trial earlier this year on two of our 11 production lines to test the feasibility of returning to paper, which we used quite a while ago prior to changing to the film which has become the norm over the past 15 or so years. The trial has been concluded, so we are back to film and are assessing our findings on how it ran in the factory and, very importantly indeed, how our customers react when they find their biscuits wrapped differently.Your vote is clearly a positive one, and I have recorded it as such. You are definitely part of our market research! Ultimately, we may make the change but the jury is still out, so to speak. I can make no promises except to say the subject is very high on our current agenda. Thank you again for taking the time to contact us. Thanks to my colleague @ewanaitken for alerting me to a campaign to ban plastic bags in Edinburgh. I feel like an old hand at this because more than ten years ago I started selling hessian Fairtrade shopping bags for £1 each through Vetaid (where I was working at the time). I got the idea from Germany where it was commonplace to use these types of bag. As well as being better for the environment they are also stronger, so no chance of bottles dropping through the bottom or cutting off the circulation to your fingers as you would with a heavy plastic bag. I sourced the bags through Traidcraft (who provide a wholesale and sourcing service as well as running their own mail order business). They even had our logo printed on them. To be able to retail them for £1 and make 50% profit I had to buy a very large quantity. Unfortunately the delivery arrived on a day I was out of the office and required a forklift truck to unload it from the lorry. I was not popular in the office that day. Unfortunately, like a lot of my ideas it was a bit too ahead of its time and not a great success. Fast forward five years and supermarkets were selling very similar bags for £1 each. However, there is a practical problem with such bags, or even the ubiquitous "bag for life". Its fine if you are going out with the intention of doing shopping and you take the bags with you, but if you need to pop in to a shop unexpectedly its not much help. I try to carry a plastic carrier bag in my coat pocket, but its not an ideal solution. As I found out last week when I bought two bags worth of stuff, but only had one bag, Marks and Spencer do not appear to sell non plastic bags. Even if they did, they would join my growing pile of "bags for life", which in reality will probably last a lot longer than I do. Anyway, this brings me to the point of this article. There has to be a point-of-sale solution to the lack of bag problem for casual shoppers and I think I have an idea. Shops should provide the hessian type bags for a £1 refundable deposit. This would give people access to a means of carrying their shopping home without it adding to their pile of carrier bags at home or ending up in landfill. Even if they did end up in the bin, hessian is biodegradable. Supermarkets can easily afford to do this, and at £1 they would still be making a profit on any non-returned bags. Smaller shops could join a scheme to purchase bags at 50p so they were on a level playing field with big retailers. Because the charge for the bag is refundable its a better deal for consumers than the "deterrent" fee of 5p being charged by M&S. Do you think this would work? Please leave a comment. There is a lack of harmony in what our eyes perceive, when we wish to permeate ourselves with the Christmas mood, and wish to receive this Christmas mood from what we can see in today's environment. There is a discord in seeing the streets bedecked with Christmas trees and other decorations in preparation for the festival, and then seeing modern traffic rushing through the midst of it all. And if modern man does not feel the full extent of this discord, the reason may well be that he has disaccustomed himself to be sensitive to all the depth and intimacy which can be connected with this approaching festival. Of all that the Christmas festival can do to deepen man's inner nature, basically no more is left today, especially for the city dweller, than a last faint echo. He is hardly in a position to feel even vaguely its former greatness. His habits prevent him from perceiving this greatness any longer, a greatness to which humanity had become accustomed in the course of centuries. How far back do we need to go to find that non-commercialised Christmas? 1960? 1940? 1920? Except that the above quotation is from a lecture given in Berlin on 22nd December, 1910* (by Rudolf Steiner). He is clear that the golden age of Christmas had already gone by then, so maybe we look back to a golden age that never really existed? Or maybe we were rose tinted contact lenses. According to these poll results from gallup, support for young earth creationism in the USA is on the wane. Most interestingly, and what's not being picked up by most commentators, is that those losses are mainly being picked up by "theistic evolution", a belief that evolution is true, but God had a hand in it. This may be troubling for groups like Answers in Genesis who insist that its a straight choice between creationism or atheism. What might also bother them is that since they started campaigning in the early 1990's support for a young earth position has actually declined. How much of that is due to the declining fiortunes of churches which support this type of theology remains to be seen. Sadly, the situation in the UK is advancing in the opposite direction with the number of churches supporting a creationist position increasing. I notice that there is now one church in Scotland which requires belief in young earth creationism in order to be a member. I had predicted the likelihood of this happening in a previous posting to this blog. Two of the over-riding factors in the expansion of creationism in UK evangelical churches is the increase in support from the USA (both financially and through visiting influential preachers) and the distillation of the declining church to a narrower group of people with an increasingly complex system of belief. I believe this is a temporary blip in the development of the church in the UK and that it will reach a peak and then decline as it has done in the USA. Apparently Wesley was something of a physician as well as a preacher. One of my colleagues has a copy of his book "Primitive physic: or, an easy and natural method of curing most diseases". Never having seen this before I have found it a fascinating insight into medical treatments in the late 18th century. You can read the full book in Google Books by clicking here. Earlier this week I was reminded about the area of Kirkcaldy known as St Clair and wondered if there was a connection with my Sinclair (St Clair) ancestors. I have been doing a bit of digging and it seems that there is and that St Clair is named after them. 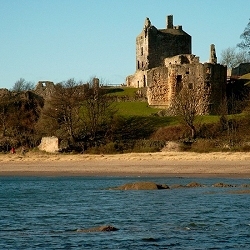 The most remarkable object of antiquity near the town is the castle of Ravenscraig, situated on a rock, projecting into the sea, at the east end of Kirkcaldy. It, with the lands adjoining, was given by James III. to William St. Clair, Earl of Orkney, when he resigned the title of Orkney. It has ever since been possessed by the family of St. Clair. It was inhabited in Oliver Cromwell's time, and was fired upon by a party of his troops. It has, for many years, been uninhabited and in a ruinous state. You can read the history of Ravenscraig Castle here. William Sinclair (1410-1484), 3rd Earl of Orkney was my 12th Great Grandfather (i.e. great great great great great great great great great great great great grandfather). He was the Sinclair who built Rosslyn Chapel. Sadly, my branch of the family is descended from one of his many children from his three marriages and was disinherited in 1606 after a family dispute. Following this they were banished to Shetland where future generations lived quite poor lives. So there is not much change of me getting my castle back. The area of St Clair in Kirkcaldy is also known as Sinclairtown or Sinclairton and includes street names like Rosslyn Street, Caithness Place and Sutherland Place which all relate to places important to the Sinclair family of that time. Click here for a map. Following on from my article about the fairy boy of Leith I thought I would set out some of my theory of similarities between modern UFO phenomenon, alien abduction and traditional stories about fairies, elves and goblins. In doing this I have used the same source as my previous article for examples (Sir Walter Scott in his Poetical Works Vol 2) although similar stories are commonplace. Fairies are usually described as smaller than people and having an appearance which brings fear or awe. Their attributes, amongst which we recognise the features of the modern fairy, were, supernatural wisdom and prescience, and skill in the mechanical arts, especially in the fabrication of arms. They are farther described, as capricious, vindictive, and easily irritated. If we replace fabrication of arms (the high technology of its day) with expertise in technology then all of these attributes are ones also ascribed to aliens. Fairies were considered to live underground or underwater, both of which are features of "UFO base" stories. Fairies can interbreed with humans which fits with the alien/human hybrid hypothesis. Gervase of Tilbury, in the Olia Imperialia, mentions certain hags, or Lamice, who entered into houses in the night-time, to oppress the inhabitants while asleep, injure their persons and property, and carry off their children. A tradition existed, during the seventeenth century, concerning an ancestor of the noble family of Duffus, who, " walking abroad in the fields, near to his own house, was suddenly carried away, and found the next day at Paris in the French king's cellar, with a silver cup in his hand. Being brought into the king's presence, and questioned by him who he was, and how he came thither, he told his name, his country, and the place of his residence ; and that, on such a day of the month, which proved to be the day immediately preceding, being in the fields, he heard the noise of a whirlwind, and of voices, crying, ' Horse and Hattock !' (this is the word which the Fairies are said to use when they remove from any place,) whereupon he cried ' Horse and Hattock' also, and was immediately caught up and transported through the air, by the Fairies, to that place, where, after he had drunk heartily, he fell asleep, and before he woke, the rest of the company were gone, and had left him in the posture wherein he was found. It is said the King gave him the cup which was found in his hand, and dismissed him." The narrator affirms, " that the cup was still preserved, and known by the name of the Fairy cup." He adds, that Mr Steward, tutor to the then Lord Duffus, had informed him, that, " when a boy at the school of Forres, he and his school-fellows were upon a time whipping their tops in the churchyard, before the door of the church, when, though the day was calm, they heard a noise of a wind, and at some distance saw the small dust begin to rise and turn round, which motion continued advancing till it came to the place where they were, whereupon they began to bless themselves ; but one of their number being, it seems, a little more bold and confident than his companions, said ' Horse and Hattock with my top,' and immediately they all saw the top lifted up from the ground, but could not see which way it was carried, by reason of a cloud of dust which was raised at the same time. They sought for the top all about the~place where it was taken up, but in vain ; and it was found afterwards in the churchyard, on the other side of the church. "—This puerile legend is contained in a letter from a learned gentleman in Scotland, to Mr Aubrey, dated 15th March, 1695, published in Aubrey's Miscellanies, p. 158. People coming across fairies tend to do so in the woods, on hills or near where they have some form of transportation (usually horses). It does seem that whatever people are experiencing with UFO's and aliens is very similar or identical to the experiences of people with fairies in earlier times. I present this as my theory. You may wish to comment if you agree or disagree. I am sure I will have more stories to add as time goes on. 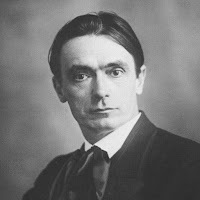 Following on from my article about Steiner influence in Edinburgh I thought I would give a brief summary of the theological and philosophical ideas contained in Rudolf Steiner's writings. Its a very brief resume and it may not be 100% accurate and it is simply my understanding of what he was writing about. However, I think it gives a number of important clues to why so many social care and educational organisations have originated within Anthroposophy. I have underlined these where I think they exist. Steiner has two sides to his work. Firstly as a philosopher (especially his early writings) and secondly as a theologian following his involvement with Theosophy. His theology is most pronounced in his Christology which, although wildly different from orthodox Christianity, jumps through hoops to try and deal with some inconsistencies in the biblical account of Jesus' origins. These sections are in no particular order. Steiner uses the word Ego differently from Jung. Steiner's ego is self consciousness. This is the bit that undergoes reincarnation. He divides it into lower and higher ego. The ego has to be in control of the three lower functions. Christ has conferred on us the principal of individuality. God describes himself as “I am”. This is given to us when Christ is incarnated, died and risen (which Steiner refers to as a single event he calls "the mystery of Golgotha"). We are all individuals but at the same time we are one. We have the ability to transform our abstract ideas into concrete ideals by recognising ourselves as body, soul and spirit and using higher faculties to transform the world. In Hinduism and Buddhism karma is about cause and effect. People suffer consequences for actions in a previous life. Steiner uses the word karma more flexibly to mean something like destiny. Steiner did not believe that personal blame was always attached to someones actions because something could happen as the result of someone elses actions or by accident or chance. Steiner believes that we are destined to be with the people we need to be with in order to improve our spiritual being during this life and that these associations are organised by divine beings (angels). He calls these karmic relationships. We can take our intention to heal and transform the earth into the next life and build on it. Humanity as a whole is developing as time moves forward. Each step is appropriate for its time. We need to live free in the moment to accept what comes, being awake to the possibility that we may be connected to other people in ways we do not expect. We need to set aside physical or personality issues that may repel us and accept human beings as they are. Steiner describes evil has a twofold nature which he gives these names. Ahrimanic - fetters us to the earth, materialistic, binding us to the earth so that we can never experience divine intelligence or the spiritual world. (technlogy, power, control, fear of loss of control, reductionist). These are qualities of our own being, not physical entities although they could be incarnated as such and he prophesies an incarnation of Ahriman in the third millenium after Christ. On the one hand Scientists and religious fundamentalists tend towards the ahrimanic, mechanistic view of life and become bogged down. On the other hand the religious ecstatic is unable to function in the world as he is too spiritual. What is “good” is the balance between these two extremes. Christ acts as the mediator of these two extremes. The lie is the diminishing of the individual by mass manipulation and the mass media whether in politics, advertising or celebrity culture. Technology is isolating people from one another and we are living in an artificial, imaginary, world. It is also deadening our spiritual senses. We need to counter the power of the lie to maintain reality. To counter the lie we need to come to a knowledge of the truth of man as Body Soul and Spirit and the inherent dignity which this signifies. When Steiner talks about freedom he is not talking about a libertarian or anarchistic view of freedom but an state of "freedomhood" which is innate but which we can diminish. In his view we need to take account of others and not do anything which would affect their freedom. We cannot control the world, but we need to be active in it, not passive, and responding to what we experience physically and spiritually. Personal freedom of thought is essential. To Steiner thinking is a sense which we can develop and use to understand and experience the spiritual realm. We do not wait for revelation. We can reach towards spiritual knowledge through thought. Thought is a sense. Thinking is a spiritual activity which we can develop until we are able to see the hidden divinity (the Christ) in every human being. Our ultimate aim should be to get to the point of being unable to sleep while another human being suffers. In summary, Steiner believes that Christ is a seperate being from Jesus. He is an avatar who came into Jesus at his baptism. At the crucifixion his blood saturated the earth and transformed in a type of transubstantiation. Steiner views Jesus as the cosmic Christ of John's gosepl, beyond traditional religion and waiting to be discovered. He is active in the earth in the spiritual (etheric) realm. He can only be experienced with a higher faculty or consciousness. We are called on to develop these so we can experience Christ. Christ provides the impulses and ideas for developing ourselves and helping others. Steiner believes there were two seperate Jesus children (one descended from Nathan one from Solomon). Since Steiners day we have discovered that the Essenes expected two Messiahs so a belief in two is not unique to Steiner. Matthew and Luke’s gospels have different genealogies of Jesus. Zoroaster’s ego reincarnated into the Solomon Jesus which is why the Magi came looking for him. The Solomon Jesus is very knowledgable and is the one described as a boy in the temple with the teachers of the law. The Nathan Jesus is very loving and compassionate but his physical body was weak. Today we might consider him to have a learning disability. However, his astral body was inherited from the Buddah. Buddah’s mission is to develop a sense of compassion and love eventually perfecting himself through many reincarnation cycles. At the age of 12 the ego of Zoroaster transmigrated from the Solomon Jesus into the ego of the Nathan Jesus so we have a fusion of the two. Knowledge and compassion are now combined. The Solomon Jesus dies and Mary goes to live with the family who have the Nathan Jesus plus his brothers and sisters. There is then a gap from the age of 12 to 30. Steiner advances the idea that Jesus spent this time with the Essenes. This was before the discovery of the dead sea scrolls, so Steiner is quite early in promoting this. Jesus rejects the way of the Essenes and wanders in the desert eventually meeting John the baptist who had also rejected the Essene teachings. John is a reincarnation of Elijah. John becomes Jesus’ teacher. John baptises Jesus at the age of 30 and at that moment the Christ being descends from the sun and takes up residence in Jesus. Christ is important to Steiner because he is composed of these various spiritual beings and perfected souls. None of these can incarnate again because they are perfect. This is why Steiner rejects a second coming of Christ as a physical being. Christ lives for three years and is then dissolved into the etheric body of the earth through his blood in a form of transubstantiation of the earth. He then descends into hell (the afterlife) and illuminates it. Changing it from the dark place the Greek’s understood it to be into something more like the Egyptian understanding of the afterlife. The Christ event is pivotal to Steiner because brings true individuality. People are no longer part of a tribal group, they are individuals. This is typified by his use of the “I am” statements in John’s gospel and God (the Christ being) revealing himself as “I am” to Moses in the burning bush. Christ teaches people how to be true individuals which opens up new possibilities of spiritual contact for those who take up the Christ impulse. This is part of a new phase of evolution where people can perfect their etheric bodies thorugh renewed contact with the spiritual world. The spiritual beings (angels) are interested in us, but this is intended to be a relationship. There are barriers between us and the angels, generally the Ahrimanic influence. We can come to know these beings by developing our spiritual faculties which allow us to overcome the Ahrimanic influence. Steiner’s idea of the fall is that at some point in history human beings stopping having contact with spiritual beings and reduced their etheric bodies to occupy the same space as their physical bodies so they could not sense or experience the spiritual. The coming of Christ makes it possible to reverse this. The latest stage of human development has been from about 1400 AD when people started using their individuality to have mastery over the physical world using machines. Steiner sees this as an incorrect use of individuality and the cause of a lot of society’s problems. He believes that in 1879 he believes there was a war between the archangel Michael and ahrimanic beings who had been expelled from the astral plane (heaven) and were wandering the earth looking for the souls of men. As a result of this war (which resulted in great political unrest and the first world war) Michael became part of the etheric body of the world along with Christ. This begins a new spiritual age where the intellectual mind will be put to spiritual use through “spiritual science” which Steiner called Anthroposophy. Steiner’s creation myth is very complex involving the different types of spiritual beings existing before the current solar system. These are the angels of today and are the agents of creation. Creation takes place on the spiritual plane which means that his creation myth is not intended as a description of physical events. Steiner gets this information by clairvoyant means from the Akashic record which is described as a recording or memory of knowledge of past events within the physical substance of the earth. Steiner invites us to enter on a spiritual path, but does not seek to control us or lay down a categorical method. We are to develop our thinking faculty until we can recognise interconnectedness. Anthroposophy is a world view embracing every aspect of the world because the world is a living whole with everything being interconnected. The human being is at the centre of that because we are a microcosm of this interrelatedness as body, soul and spirit. Of course, the main problem with Intelligent Design is that the people promoting it claim not to be doing it from religious motives when many of them are fundamentalist Christians who have previously promoted religious creationism. The reason for this is that they want ID taught as part of the UK school curriculum and they can’t do that if they tell the truth and say its a religious doctrine. So much for their claim that God is a God of truth. For me this is the real problem with ID. If people want to promote creationism then let them do it honestly. Dishonesty like this just brings Christianity further into disrepute. You can read more about this in my article "why creationism is bad for Christianity". Incidentally, Behe’s own university now has a disclaimer on its web site stating its support for evolutionary biology.